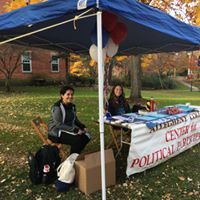 The Center for Political Participation (CPP) partners Allegheny College students and faculty with local, state, national, and international communities to undertake interdisciplinary approaches to both learning about and addressing political, economic, and social challenges. Each of the programs and partnerships of the CPP is directed at emphasizing political participation broadly conceived. Self-governance and the maintenance of democratic institutions require more than electoral participation; the vitality of those institutions is contingent upon our commitment to principles of citizenship and responsibility, These principles inform our five programmatic emphases at the CPP. 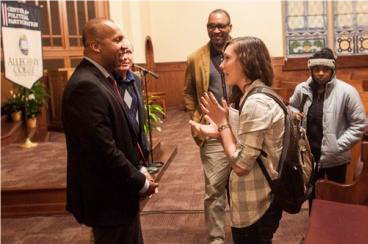 Our work is directed at providing opportunities for learning about important issues, events, institutions, and patterns of behavior that relate to complex questions of local, regional, national, and international consequence. We then link those issues of public consequence with students’ energy, creativity, and commitment in order to invigorate civic learning. Through a diverse offering of collaborative research, community-based learning, conferences, undergraduate research, public lectures, seminars, workshops, and student fellows programs, the CPP is the region’s preeminent resource for liberal arts programming for the public good.